Why is welding safety equipment important? Molten metal, noxious fumes and scathing ultraviolet and infrared light are just a few of the hazards that welders deal with. Wearing the correct safety equipment can protect you from these dangers, so you can focus on welding. Shielding your face and neck from sparks and radiation, a welding helmet is as essential to welding as a welding machine and torch. Without a helmet (or hood or mask), the powerful radiation emitted by the arc can quickly damage your skin and eyes. KMS Tools has a great selection of welding helmets. We recommend auto-darkening welding helmets for both new welders and experienced pros. Since you don’t need to flip them up and down between welds, auto-darkening helmets make it easier to produce consistent high-quality welds. They also eliminate neck fatigue caused by flipping traditional fixed-shade helmets. With so many factors to consider when choosing a welding helmet, we devoted an entire post to selecting the right one. When working in close quarters, it’s not always possible to wear a full welding helmet. In these scenarios, options include goggles and hand-held face shields. Usually equipped with #5 lenses and designed for brazing and cutting, welding goggles don’t offer enough shade for more powerful welding processes. They also leave your skin completely exposed. A hand-held shield, well, needs a hand to hold. 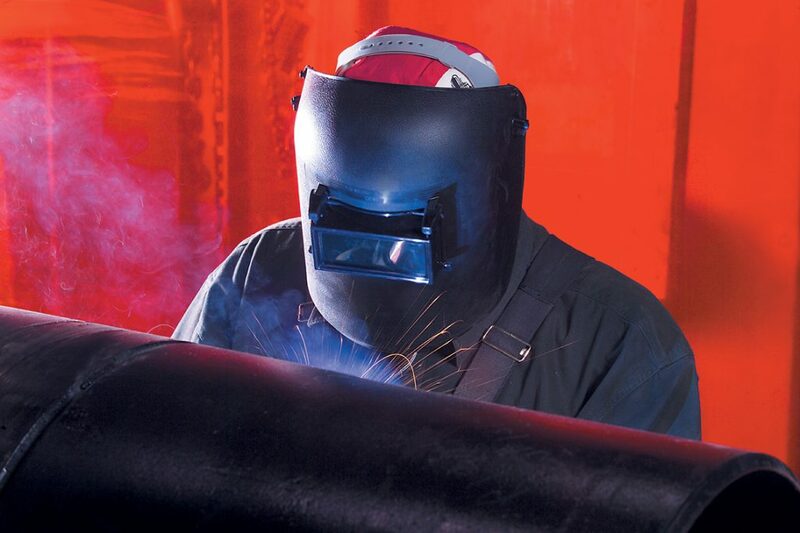 The Miller Weld-Mask is an innovative solution for close-quarters applications. 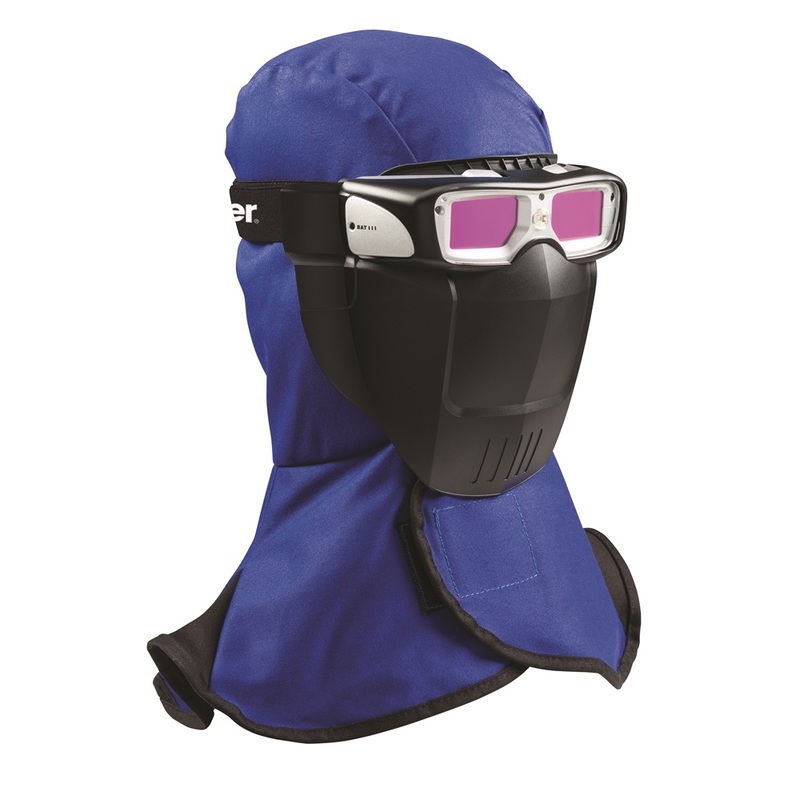 It features a hood to protect your face and neck, and auto-darkening goggles shade to #13. For a closer look at the features and benefits of the Miller Weld-Mask, read this post from October . Remember that welding helmet manufacturers recommend wearing safety glasses beneath your welding helmet, so find a pair that’s comfortable and compliant with national safety standards. These baby blues mean business. Protect your peepers and wear standard-compliant safety glasses under your helmet. Welding is a tactile endeavour. Comfortable, flame-resistant welding gloves go a long way to facilitating a focused and productive welder. Protection is key. Your hands work in close proximity to the arc, exposed to intense heat and radiation. But maintaining dexterity is also important, especially when TIG welding. With so many options available—including women’s gloves—it’s possible to find the right size and style to suit almost any welder or application. Stick and heavy-duty MIG welding gloves are made to protect you from heat and spatter. Look for gloves with heavy stitching, flame-resistant construction and multiple layers of insulation. Some heavy-duty welding gloves feature silicone patches for additional protection from heat and spatter. Standard-duty MIG welding gloves are often made of leather and offer more dexterity and less insulation than their heavy-duty counterparts. Heavier MIG gloves are lined, and light- to medium-duty options are unlined. Have a look at these Miller, Lincoln, and Watson welding gloves if MIG welding is your primary application. TIG welding gloves combine flexibility and durability. To allow for extra dexterity, TIG gloves are unlined and made of soft, heat-resistant leather, like deer or goat hide. While individual TIG welders maintain their own preferences, most agree that TIG gloves should fit snug, so you can maneuver electrodes without difficulty. KMS has TIG welding gloves in a range of styles and brands. 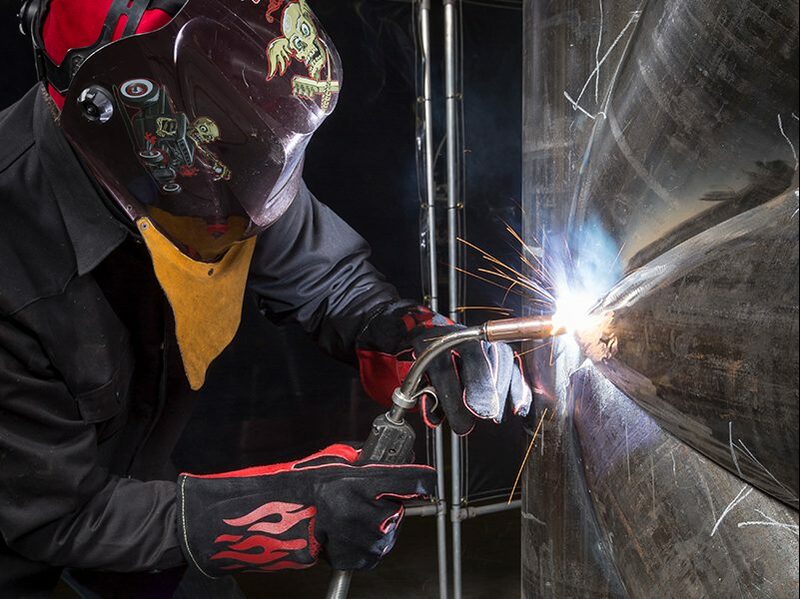 Like all welding safety equipment, welding jackets are effective when they feature durable flame-resistant materials, fit properly and, most importantly, are actually worn by the welder. Comfort is a key component in wearability, so choose a jacket that is appropriate for the process and application. For light-duty welding applications, cotton jackets are available in both treated flame-resistant cloth and engineered flame-resistant cloth, like these Miller Indura jackets. While either can spare your skin from heat without bogging you down with unnecessary weight, Indura jackets are washable and more durable than classic cotton jackets. Welders have worn leather jackets for decades. They offer excellent durability and flame resistance in medium- and heavy-duty applications. Trouble is, it gets hot underneath all that heavy pigskin. Still, leather offers the best combination of durability and protection. Some manufacturers offer jackets with leather sections protecting areas that face the most heat and fire-resistant cotton elsewhere. Jackets made with proprietary flame-resistant fabrics bring together the durability and protection of leather with the lightness of cotton. For example, Miller’s WeldX jacket will shed sparks and spatter like leather without the weight. Contact the welding department at your nearest KMS Tools location to order specialty welding jackets or clothing. When worn beneath a jacket, a welding apron can offer additional protection for a welder’s legs and chest. Pair it with a flame-resistant shirt and leather sleeves for protection during light-duty welding. Melting metal emits a medley of fumes. Wearing a respirator is a good way to keep all that nasty stuff out of your lungs. KMS Tools has respirators (and replacement cartridges) designed to fit beneath a welding helmet and filter out the tiny particles of metal that take to the air during arc welding. Often made with funky patterns and colourful threads, a welding hat can add a little personality to a welder’s personal protective equipment. While some welders like hats with a soft brim they can position over either ear to protect from sparks and slag, others prefer beanies or bandannas to help keep sweat out of their eyes. 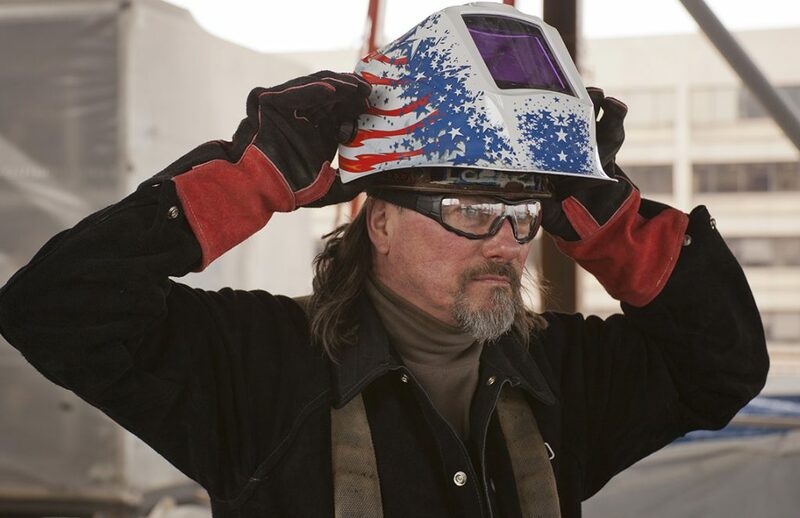 Regardless of style preferences, the best welding hat will deliver both comfort and protection. Choose one that fits nicely beneath your welding helmet or hard hat, and remember that heavier cotton provides extra cushioning but can get hot over the course of the day. Always wear leather work boots that comply with local safety standards. Welding-specific work boots offer additional protection on the top of your foot, shielding your laces from sparks and protecting your metatarsal from heavy objects. If you weld occasionally on the job, you might want to consider heat-resistant leather spats. Spats can protect from sparks and spatter, and aren’t as expensive as welding-specific boots. If you want to learn more about welding apparel or safe welding practices, talk to a welding expert at your local KMS Tools branch. If you’re new to welding, or want to learn a new technique, consider attending one of our welding classes. Ready to start shopping? Download this handy checklist to make sure you get everything you need. This entry was posted in Archives, Welding and tagged safety equipment, Welding by Your Friends in the Tool Business. Bookmark the permalink.